Today’s mobile phone is having all the features of a Personal Digital Assistant (PDA). But till recently there was no way for a Java application to incorporate the functionalities of a PDA in it. We could not access the contact information, the calendar and scheduling information and even the file system. To eliminate these difficulties the PDA Profile API’s were added. These API’s are optional and hence are not there in many mobiles. But the day is not far when almost all handsets will support this API. One of the biggest features a Personal Digital Assistant (PDA) sport’s is Personal Information Management (PIM). There have been numerous instances when our clients have requested us for applications that could use the personal information of the user which already exists on his/her mobile. But unfortunately before the introduction of this package we had to turn down there requests. Realizing the great problems being faced by the J2ME developers the founders of J2ME have introduced this package. These APIs have been defined in the JSR 75. One of the biggest plus points of this package is that it can be made available on the phone independent of the need for any particular configuration or profile. This package helps us in using the calendar and contact data of the user that is available on the phone. Now we will study this package in detail. The Contact interface represents a single contact entry in the Personal Information Module Contact database. This interface supports a subset of the fields defined by the vCard specification from the Internet Mail Consortium (http://www.imc.org). This is the field that specifies an address for the Contact. This is the field that specifies the birthday of the Contact. The Data for this field is in the same long value format as java.util.Date. To remind you the java.util.Date keeps time as milliseconds since the epoch (00:00:00 GMT, January 1, 1970). This is the field that specifies the desired access class for this contact. This is the field that specifies an e-mail address. This is the field that represents a formatted version of a complete address for the Contact entry. This is the field that represents a formatted version of a name for the Contact entry. This is the field that specifies the name for this contact. This is the field that the data represents a nickname. This is the field that specifies the supplemental information or a comment associated with a Contact. Field specifying the organization name or units associated with a Contact. This is the field that specifies a photo for a Contact. This is the field that specifies a photo of a Contact. This is the field that specifies the public encryption key for a Contact. This is the field that specifies the last modification date and the time of a Contact item. This is the field that stands for a voice telephone number. This is the field that specifies the job title for a Contact. This is the field that specifies a unique ID for a Contact. This is the field that specifies the uniform resource locator for a Contact. This is the attribute classifying a data value as related to an ASSISTANT. This is the attribute classifying a data value as related to AUTO. This is the attribute classifying a data value as related to FAX. This is the attribute classifying a data value as related to HOME. This is the attribute classifying a data value as related to MOBILE. This is the attribute classifying a data value as "OTHER". This is the attribute classifying a data value as related to PAGER. This is the attribute classifying a data value with preferred status for retrieval or display purposes (platform specific). This is the attribute classifying a data value as related to SMS. This is the attribute classifying a data value as related to WORK. This field defines an index into the string array for an address field, where the data at this index represents the post office box of a particular address. This field defines an index into the string array for an address field, where the data at this index represents any extra info of a particular address. This field defines an index into the string array for an address field, where the data at this index represents the street information of a particular address. This field defines an index into the string array for an address field, where the data at this index represents the locality (for example, a city) of a particular address. This field defines an index into the string array for an address field, where the data at this index represents the region (for example, a province, state, or territory) of a particular address. This field defines an index into the string array for an address field, where the data at this index represents the postal code (for example, a zip code) of a particular address. This field defines an index into the string array for an address field, where the data at this index represents the country of a particular address. This field defines an index into the string array for a name field, where the data at this index represents the family name. For example: “JAIN” or “GATES”. This field stands for a constant which indicates that this contact's class of access is confidential. This field stands for a constant which indicates that this contact's class of access is private. This field stands for a constant which indicates that this contact's class of access is public. This method returns an integer representing the index of the value that is marked as preferred. The ContactList interface represents a Contact list containing Contact items. The field is the constant for the itemsByCategory (java.lang.String) method to indicate to search for uncategorized items. This method returns a new empty Contact object associated with this list. The Contact is not persistent in the list until a call to PIMItem.commit () for the Contact is made. This method returns a newly created Contact. This method removes the specific Contact from the list. This interface represents a single Event entry in a PIM Event database. The fields contained in this interface are a subset of the fields in the vEvent object defined by the vCalendar 1.0 specification from the Internet Mail Consortium (http://www.imc.org). This field specifies a relative time for an Alarm for this Event. This field specifies the desired access class for this contact. Data associated with this field is of int type, and can be one of the values CLASS_PRIVATE, CLASS_PUBLIC, or CLASS_CONFIDENTIAL. This field specifies the non-inclusive date and time a single Event ends. The Data for this field is in the same long value format as java.util.Date. To remind you the java.util.Date keeps time as milliseconds since the epoch (00:00:00 GMT, January 1, 1970). This field identifies the venue for this Event. The data for this field is in string format. Example: "SKJ Mansion, Delhi"
"I have to meet Mr. Dell Today. I will talk to him regarding the issues we are facing in selling our products." This field specifies the last modification date and time of an Event item. This field specifies the inclusive date and time a single Event starts. This field specifies the summary or subject for this Event. The data for this field is in string format. For example: "Meeting with Mr. Dell"
This field specifies a unique ID for an Event. It can be used to check for identity using String.equals method. This is the constant indicating this event's class of access is confidential. This is the constant indicating this event's class of access is private. This is the constant indicating this event's class of access is public. This method returns the RepeatRule describing how often this Event occurs or null if a RepeatRule has not been set. This method sets the RepeatRule specifying how often and when this event occurs. EventList represents an event list containing event items. This field stands for a constant representing a search type for events based on the event occurrence's specific start date/time. This field stands for a constant representing a search type for events based on the event occurrence's specific end date/time. This field stands for a constant representing a search type for events based on any occurrence of an event during a time period. This method returns a new empty Event object associated with this list. This Event onject is not persistent in the list until a call to PIMItem.commit () for the Event is made. This method imports the given Event into this list by making a new Event for the list and filling its information with as much information as it can from the provided Event. In case the input Event already exists in the list, a new Event is still created with information similar to the input item which may not necessarily be identical. This method removes an already existing Event from the list. This method returns an enumeration of all the Events with an occurrence between startDate and endDate. This method returns an array of integer values corresponding to the Repeat Rule fields that are supported by this list for the given frequency. FieldEmptyException represents an exception that is thrown when an attempt is made to access a field that does not have any data values associated with it. This constructor constructs a new instance of this class with its stack trace filled in. This constructor constructs a new instance of this class with its stack trace and message filled in. This constructor constructs a new instance of this class with its stack trace, message and offending field filled in. This method returns int representing the offending field. FieldFullException represents an exception that is thrown when an attempt is made to add data to a field but the field already has all available slots for data values assigned. This method returns an int value representing the offending field. PIM class is the class which helps us in accessing PIM lists on a device and performing functions related to personal information management. PIM class consists of static methods for getting the names of the existing PIM lists, opening the lists, and converting raw data streams to and from PIM items for importing and exporting into those lists. This constructor is a constructor for subclasses. To get an instance of the PIM class we use the getInstance method instead of the constructor. This field stands for the constant representing a Contact List. This field stands for the constant representing an Event List. This field stands for the constant representing a ToDo List. This field stands for the constant representing opening a list in read only mode. This field stands for the constant representing opening a list in write only mode. This field stands for the constant representing opening a list in read/write mode. This method returns an instance of the PIM class. This method is the method which is normally used for getting an instance of this class. This method returns the default PIM list for the indicated PIM list type. This method returns the named PIM list. This method returns a list of named PIM lists. This method creates and fills one or more PIM items from data provided in the given InputStream object when the data is expressed in a valid data format supported by this platform. This method returns an array of newly created PIM items created from the OutputStream. This method writes the data from the given item to the given OutputStream object as Unicode characters in a format indicated by the parameter. This method returns String array of data formats supported for converting items to and from data streams. PIMException represents exceptions thrown by the PIM classes. PIMException class has a reason code optionally associated with it. This reason code provides more information about the PIM exception that occurred. This constructor constructs a new instance of this class with its stack trace filled in. The reason code for this exception is set to the default value of GENERAL_ERROR. This constructor constructs a new instance of this class with its stacktrace and message filled in. This constructor constructs a new instance of this class with its stacktrace, message and reason filled in. This field indicates a PIM exception where the functionality is not supported in this implementation. This field indicates a general PIM exception error. This is the default value for the reason code. This field indicates a PIM exception where a list is closed and access is attempted. This field indicates a PIM exception where a list is no longer accessible by the application, such as if the underlying PIM database is deleted. This field indicates the max number of categories is exceeded. This field indicates the data is in an unsupported PIM version. This field indicates a PIM exception where the update could not continue. This method returns an int reason value for the exception. PIMItem represents the common interfaces of an item for a PIM list. It represents a collection of data for a single PIM entry. This field stands for a data type indicating data is binary in a byte array. This field stands for a data type indicating data is of boolean primitive data type. This field stands for a data type indicating data is a Date in long primitive data type format expressed in the same long value format as java.util.Date. This field stands for a data type indicating data is of int primitive data type. This field stands for a data type indicating data is a String object. This field stands for a data type indicating that data is an array of related fields returned in a string array. This field stands for a constant indicating that no additional attributes are applicable to a data value for a field. This field stands for a constant indicating the minimum possible value for an extended field constant. This field stands for a constant indicating the minimum possible value for an extended attribute constant. This method returns the PIMList that this item belongs to. In case the item does not belong to any list the null value is returned. This method stores the data in the item to its PIM list. This method returns the boolean value true if any fields have been modified since the item was last retrieved or committed. It returns false otherwise. This method returns int array of fields that have data currently stored for them. If no fields contain data a zero length array is returned. This method returns a byte array representing a value for the field. The value is an inline binary data representation in a "B" binary encoded string as defined by [IETF RFC 2047]. This method adds a binary data value to a field in the item. This method sets an existing binary data value in a field to a new value. This method gets a date value from a field in the item. This method adds a date value to a field in the item. This method sets an existing date data value in a field to a new value. This method returns an int representing a value of the field. This method adds an integer value to a field in the item. This method sets an existing int data value in a field to a new value. This method returns a String representing a value of the field. A null String (String s “”) may also be returned by this method. This method adds a String value to a field in the item. This method sets an existing String data value in a field to a new value. This method returns a boolean representing a value of the field. This method adds a boolean value to a field in the item. This method sets an existing boolean data value in a field to a new value. This method returns a String array representing a group of related values from the field. This method adds an array of related string values as a single entity to a field in the item. This method sets an existing String array data value in a field to a new value. This method returns int indicating the number of values currently assigned to the field in this item. This method removes the value at the given index for the indicated field in this item. This method returns int representing the attributes assigned to the value at the given field and index. This method adds a category to this item. This method returns a string array of all the categories for the item. This method returns the maximum number of categories that this item can be assigned to. 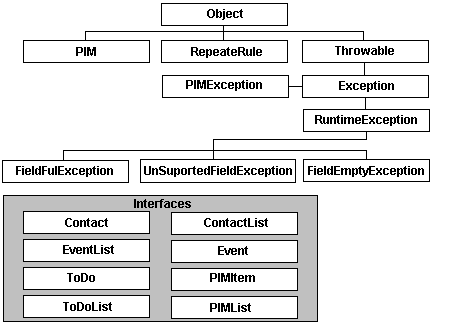 PIMList represents the common functionality of a PIM list. It contains 0 or more PIMItems (represented by the class PIMItem). It also allows retrieval of all or some of the PIMItems contained in the list. This field is the constant for the itemsByCategory(java.lang.String) method to indicate to search for uncategorized items. This method returns a String representation of the list name. This method closes the list. In doing so it also releases any resources for this list. A PIMException is thrown for any subsequent method invocations for the class instance. This method returns an enumeration of all items. This method returns an enumeration of all items that contains fields that match all of the fields of the item parameter. This method returns an enumeration of all items that contain at least one field that matches the string parameter. This method returns an enumeration of all items in the PIM list that match the category. This method returns a string array containing the categories defined for the PIM list. This method returns true if the category indicated is a valid existing category for this list. Else it returns false. This method deletes the indicated category from the PIM list. In case the indicated category is not in the PIM list, this method successfully compeletes. This method renames a category from an old name to a new name. This method returns an int value indicating the number of categories supported by this list. 0 indicates that no category is supported and -1 indicates there is no limit to the number of categories that this list can have. This method returns true if the field is supported in this list else it will return false. This method returns an int array containing all fields supported by this list. This method returns a true value if attribute is supported for a given field. It returns false otherwise. Invalid values for fields and attributes will also return false. This method returns an int array of the supported attributes. There will be one attribute per entry in the array. In case there are no supported fields a zero-length array will be returned. This method returns true if supported in this list otherwise it returns false. Invalid fields and invalid array elements will also return false. This method returns an int array representing the supported array elements. There will be one array element per entry in the array. In case there are no supported array elements a zero-length array will be returned. This method returns int representing the type of the data associated with the field. This method returns String label for the field. This method returns String label for the attribute. This method returns String label for the array element. This method returns int value indicating the number of values that can be stored in the field. A value of -1 indicates that this field supports having an unlimited number of added values. Zero indicates the field is not supported by this list. This method returns int the size of the array of a single data instance of a string array field. RepeatRule class represents a description for a repeating pattern for an Event item. The fields contained in this class are a subset of the capabilities of the RRULE field in VEVENT defined by the vCalendar 1.0 specification from the Internet Mail Consortium (http://www.imc.org). This class is use to determine how often an associated Event occurs. This method is a default constructor. This field specifies the frequency of the Repeat. This field specifies the day of the month an Event occurs; for example, 15. This field specifies the day of the week an Event occurs. This field specifies the month in which an event occurs. This field specifies which week in a month a particular event occurs. This field specifies the number of times this event repeats including the first time, starting from the first time the event starts (derived from Event.START) and continuing to the last date of the repeat (defined by RepeatRule.END). This field specifies the ending date of the repeating event. Data for this field is expressed in the same long value format as java.util.Date. This field specifies the number of iterations of the frequency between occurring dates i.e. how often the frequency repeats. This field specifies the frequency when the Event happens every day. This field specifies the frequency when the Event happens every week. This field specifies the frequency when the Event happens every month. This field specifies the frequency when the Event happens every year. This field specifies constant for the first week of the month used with WEEK_OF_MONTH field. This field specifies constant for the second week of the month used with WEEK_OF_MONTH field. This field specifies constant for the third week of the month used with WEEK_OF_MONTH field. This field specifies constant for the fourth week of the month used with WEEK_OF_MONTH field. This field specifies constant for the fifth week of the month used with WEEK_OF_MONTH field. This field specifies constant for the last week of the month used with WEEK_OF_MONTH field. This field specifies constant for the second to last week of the month used with WEEK_OF_MONTH field. This field specifies constant for the third to last week of the month used with WEEK_OF_MONTH field. This field specifies constant for the fourth to last week of the month used with WEEK_OF_MONTH field. This field specifies constant for the fifth to last week of the month used with WEEK_OF_MONTH field. This field specifies constant for the day of week Saturday used with DAY_IN_WEEK field. This field specifies constant for the day of week Friday used with DAY_IN_WEEK field. This field specifies constant for the day of week Thursday used with DAY_IN_WEEK field. This field specifies constant for the day of week Wednesday used with DAY_IN_WEEK field. This field specifies constant for the day of week Tuesday used with DAY_IN_WEEK field. This field specifies constant for the day of week Monday used with DAY_IN_WEEK field. This field specifies constant for the day of week Sunday used with DAY_IN_WEEK field. This field specifies constant for the month of January used with MONTH_IN_YEAR field. This field specifies constant for the month of February used with MONTH_IN_YEAR field. This field specifies constant for the month of March used with MONTH_IN_YEAR field. This field specifies constant for the month of April used with MONTH_IN_YEAR field. This field specifies constant for the month of May used with MONTH_IN_YEAR field. This field specifies constant for the month of June used with MONTH_IN_YEAR field. This field specifies constant for the month of July used with MONTH_IN_YEAR field. This field specifies constant for the month of August used with MONTH_IN_YEAR field. This field specifies constant for the month of September used with MONTH_IN_YEAR field. This field specifies constant for the month of October used with MONTH_IN_YEAR field. This field specifies constant for the month of November used with MONTH_IN_YEAR field. This field specifies constant for the month of December used with MONTH_IN_YEAR field. This method returns an Enumeration of dates for the given parameters with the Enumeration containing java.util.Date instances. This method adds a Date for which this RepeatRule should not occur. This method removes a Date for which this RepeatRule should not occur. This method returns an Enumeration of dates for which this RepeatRule should not occur. The Enumeration contains the java.util.Date instances. This method returns an int representing the value of the field. COUNT, DAYNUMBER, FREQUENCY, INTERVAL, MONTH_IN_YEAR, WEEK_IN_MONTH, DAY_IN_WEEK, DAY_IN_YEAR. This method returns a Date representing the value of the field expressed in the same long value format as java.util.Date. This method sets a Date field. This method returns an array of fields that have values currently assigned to them. If no fields have values set an array of zero length is returned by this method. This method returns true if the contents of the RepeatRules are equivalent. Otherwise this method returns false. This interface represents a single To Do item in a PIM To Do database. The fields in this interface are a subset of the fields in VTODO defined by the vCalendar specification from the Internet Mail Consortium (http://www.imc.org). This field specifies the desired access class for this contact. This field specifies the ID indicating a ToDo has been completed. Data for this field is in boolean format. This field specifies the ID indicating a ToDo has been completed on the date indicated by this field. This field specifies the date a ToDo is due.The data for this field is expressed in the same long value format as java.util.Date. "Priyanka really likes stained glass and expensive pens"
This field specifies the priority of this ToDo. The priority is a value from 0 to 9. This field specifies the last modification date and time of a ToDo item. This field specifies the summary or subject for this ToDo. This field specifies a unique ID for a ToDo. This field can be used to check for identity using the String.equals method. This field specifies a constant indicating this todo's class of access is confidential. This field specifies a constant indicating this todo's class of access is private. This field specifies a constant indicating this todo's class of access is public. This interface represents a ToDo list containing ToDo items. This method returns a new empty ToDo object associated with this list. The ToDo is still not persistent in the list until a call to PIMItem.commit () for the ToDo is made. This method returns a newly created ToDo item. This method removes a specific ToDo from the list. The item must already exist in the list for this method to be succesful. This exception represents an exception thrown when a field is referenced that is not supported in the particular PIM list that an element belongs to. This method returns int value representing the offending field. One of the great problems faced by us programmers within the MIDP environment was that it was not possible to access the native file system. This posed many challenges to us programmers. Heading to the industry demand for an API for accessing file system finally the founders of J2ME have defined an API for file management in the JSR 75. This is an optional API. One of the biggest plus points of this package is that it can be made available on the phone independent of the need for any particular configuration or profile. 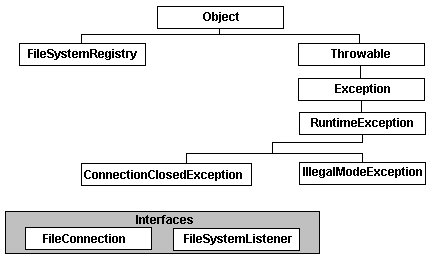 This exception represents an exception thrown when a method is invoked on a file connection but the method cannot be completed because the connection is closed. This construction constructs a new instance of this class with its stack trace filled in. This construction constructs a new instance of this class with its stack trace and message filled in. FileConnection interface is intended to access files or directories that are located on removeable media and/or file systems on a device. Device’s internal filesystems in memory may also be accessed through this class as well if there is underlying hardware and operating system support. If the file connections are not supported to a particular media or file system then the attempts to open a file connection to that particular media or file system through Connector.open() results in an javax.microedition.io.IOException being thrown. This method returns true if the file connection is open else it returns false. This method opens an input stream. This method opens a DataInputStream. This method opens an output stream. This method opens a DataOutputStream. This method returns an OutputStream positioned at the byte offset in the file or the end of the file if the offset is greater than the size of the file. This method returns the total size of the file system in bytes. It returns -1 if the file system is not accessible. This method returns the available size in bytes on a file system. It returns -1 if the file system is not accessible. This method returns the used size of bytes on a file system. It returns -1 if the file system is not accessible. This method returns the size in bytes occupied by the files included in the directory. It returns -1 if the directory does not exist or is not accessible. This method returns the size in bytes of the selected file. It returns -1 if the file does not exist or is not accessible. This method returns true if the connection's target exists, it is accessible and it is readable. Else it will return false. This method returns true if the connection's target exists, it is accessible and it is writable. Else it will return false. This method returns true if the file exists, it is accessible and it is hidden. Else it will return false. This method sets the file or directory readable attribute to the indicated value. This method sets the selected file or directory writable attribute to the indicated value. This method sets the hidden attribute of the selected file to the value provided. This method returns an Enumeration of strings denoting the files and directories in the directory. This method returns an Enumeration of strings denoting the files and directories in the directory matching the filter. This method creates a file corresponding to the file string provided in the Connector.open () method for this FileConnection. This method creates a directory corresponding to the directory string provided in the Connector.open () method. This method returns true if the connnection's target exists and is accessible, otherwise false. This method returns true if the connection's target exists, it is accessible and it is a directory. Else it returns false. This method deletes the file or directory specified in the Connector.open() URL. This method renames the selected file or directory to a new name in the same directory. This method truncates the file, discarding all data from the given byte offset to the current end of the file. This method resets this FileConnection object to another file or directory. This method returns the name of a file or directory excluding the URL schema and all paths. This method returns the path excluding the file or directory name and the "file" URL schema and host from where the file or directory specified in the Connector.open() method is opened. This method returns the full file URL including the scheme, host, and path from where the file or directory specified in the Connector.open() method is opened. This method returns the time that the file denoted by the URL specified in the Connector.open () method was last modified. FileSystemListener class is used for receiving status notification when adding or removing a file system root. This situation arises when a card is inserted or removed from a device or when a file system is mounted or unmounted to a device. This field stands for a constant indicating that a file system root has been added to the device. This field stands for a constant indicating that a file system root has been removed from the device. This method is invoked when a root on the device has changed state. This class is a central registry for file system listeners interested in the adding and removing, mounting and unmounting of file systems on a device. This method returns a boolean value indicating if file system listener was successfully added or not. This method returns a boolean value indicating if file system listener was successfully removed or not. This method returns an Enumeration of mounted file systems as String objects. This exception represents an exception thrown when a method is invoked requiring a particular security mode (e.g. READ or WRITE) but the connection opened is not in the mode required.